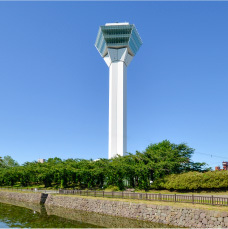 Goryokaku Tower offers free Wi-Fi as part of the Hakodate Free Wi-Fi on the second and first levels of the observation deck and atrium. Hakodate Free Wi-Fi is municipal wireless network provided by the city for the comfort and convenience of tourists. Free Wi-Fi is available at major tourist attractions within the city besides the Goryokaku Tower. Look for this Area Sign. Open the Settings and tap "Wi-Fi." Tap the dedicated SSID “00_HAKODATE_FREE_Wi-Fi” to see if your mobile phone is connected to Wi-Fi. (1) Select your social media account from a list of social media (Facebook, Twitter, and Google) to register using your social media account. Enter your ID and password on the registration page. (2) Register with email confirmation. Please enter your email address that you can receive an email for interim registration. Click the link provided in the return email that you receive at the email address to complete your registration. Once registration is confirmed, you will see a message. You are now connected to the Internet. 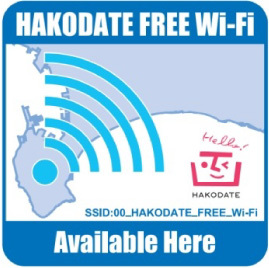 For detailed instructions on how to connect the Hakodate Free Wi-Fi and available spots, please check the website of Hakodate City.